Sanjana Santosh – third from right. 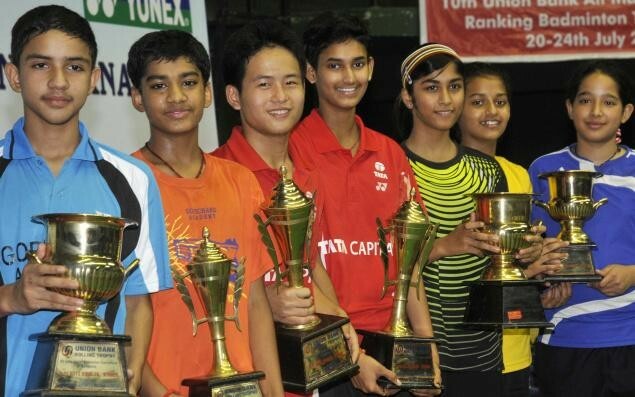 Mumbai’s upcoming and talented shuttler, Sanjana Santosh is bubbling with confidence of a successful outing with the Indian Junior (under-19) team, which will be participating in the BWF World Junior Championship to be held in Lima, Peru from 4th to 15th November, 2015. Before that the Indian team’s coaching camp will be happening at the UP Badminton Academy, Lucknow on 22nd to 31st October, 2015. The doubles events of BWF World Junior championships will start on 4th to 8th November, while Individual Events for the EYE LEVEL Cups will start from 10th to 15th November 2015. The H R College student, Sanjana, who trains at the Uday Pawar Badminton Academy (UPBA), Mumbai is the lone girl from the city to be selected in the Indian team. The 18-year-old from Goregaon, who will be representing the National team in the Team Championship and doubles events, believes she and the Indian team will do well in Peru. She does not consider any country as the favourites to dominate the championship. “All the participating countries, including China, Indonesia, Thailand, India and European countries, are more or less equally balanced and anyone has a chance to win the top honours,” observed Sanjana. The sprightly Mumbai lass, who will be partnering Anoushka Parikh of Gujarat in the doubles events, makes this assumption on her recent performances. “My parents Mum Beena and Dad Santosh K., who played football for Air India in the late 80s, have been very supportive and have encouraged me to try and do well”, she added, in gratitude.